Although those who had signed Charles I´s death warrant were punished (nine regicides were put to death, and Cromwell´s body was exhumed from Westminster Abbey and buried in a common pit), Charles II pursued a policy of political tolerance and power-sharing. In April 1660, fresh elections had been held and a Convention met with the House of Lords. Parliament invited Charles to return, and he arrived at Dover on 25 May. Despite the bitterness left from the Civil Wars and Charles I´s execution, there were few detailed negotiations over the conditions of Charles II´s restoration to the throne. Under the Declaration of Breda of May 1660, Charles had promised pardons, arrears of Army pay, confirmation of land purchases during the Interregnum and ´liberty of tender consciences´ in religious matters, but several issues remained unresolved. However, the Militia Act of 1661 vested control of the armed forces in the Crown, and Parliament agreed to an annual revenue of £1,200,000 (a persistent deficit of £400,000-500,000 remained, leading to difficulties for Charles in his foreign policy). The bishops were restored to their seats in the House of Lords, and the Triennial Act of 1641 was repealed - there was no mechanism for enforcing the King´s obligation to call Parliament at least once every three years. Under the 1660 Act of Indemnity and Oblivion, only the lands of the Crown and the Church were automatically resumed; the lands of Royalists and other dissenters which had been confiscated and/or sold on were left for private negotiation or litigation. The early years of Charles´s reign saw an appalling plague which hit the country in 1665 with 70,000 dying in London alone, and the Great Fire of London in 1666 which destroyed St Paul´s amongst other buildings. Another misfortune was the second Dutch war of 1665 (born of English and Dutch commercial and colonial rivalry). Although the Dutch settlement of New Amsterdam was overrun and renamed New York before the war started, by 1666 France and Denmark had allied with the Dutch. The war was dogged by poor administration culminating in a Dutch attack on the Thames in 1667; a peace was negotiated later in the year. In 1667, Charles dismissed his Lord Chancellor, Clarendon - an adviser from Charles´s days of exile (Clarendon´s daughter Anne was the first wife of Charles´s brother James and was mother of Queens Mary and Anne). As a scapegoat for the difficult religious settlement and the Dutch war, Clarendon had failed to build a ´Court interest´ in the Commons. He was succeeded by a series of ministerial combinations, the first of which was that of Clifford, Ashley, Buckingham, Arlington and Lauderdale (whose initials formed the nickname Cabal). Such combinations (except for Danby´s dominance of Parliament from 1673 to 1679) were largely kept in balance by Charles for the rest of his reign. Charles´s foreign policy was a wavering balance of alliances with France and the Dutch in turn. 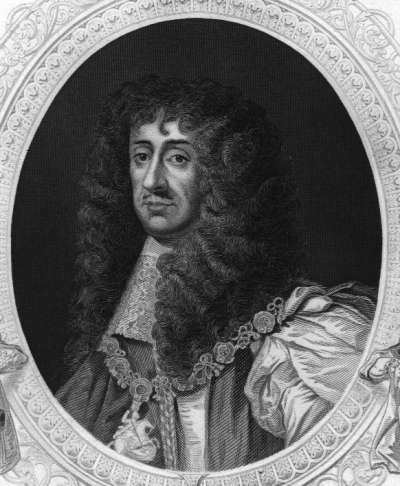 In 1670, Charles signed the secret treaty of Dover under which Charles would declare himself a Catholic and England would side with France against the Dutch. In return, Charles would receive subsidies from the King of France (thus enabling Charles some limited room for manoeuvre with Parliament, but leaving the possibility of public disclosure of the treaty by Louis). Practical considerations prevented such a public conversion, but Charles issued a Declaration of Indulgence, using his prerogative powers to suspend the penal laws against Catholics and Nonconformists. In the face of an Anglican Parliament´s opposition, Charles was eventually forced to withdraw the Declaration in 1673. In 1677 Charles married his niece Mary to William of Orange, partly to restore the balance after his brother´s second marriage to the Catholic Mary of Modena and to re-establish his own Protestant credentials. This assumed a greater importance as it became clear that Charles´s marriage to Catherine of Braganza would produce no legitimate heirs (although Charles had a number of mistresses and illegitimate children), and his Roman Catholic brother James´s position as heir apparent raised the prospect of a Catholic king. Throughout Charles´s reign, religious toleration dominated the political scene. The 1662 Act of Uniformity had imposed the use of the Book of Common Prayer, and insisted that clergy subscribe to Anglican doctrine (some 1,000 clergy lost their livings). Anti-Catholicism was widespread; the Test Act of 1673 excluded Roman Catholics from both Houses of Parliament. Parliament´s reaction to the Popish Plot of 1678 (an allegation by Titus Oates that Jesuit priests were conspiring to murder the King, and involving the Queen and the Lord Treasurer, Danby) was to impeach Danby and present a Bill to exclude James (Charles´s younger brother and a Roman Catholic convert) from the succession. In 1680/81 Charles dissolved three Parliaments which had all tried to introduce Exclusion Bills on the basis that ´we are not like to have a good end´. Charles sponsored the founding of the Royal Society in 1660 (still in existence today) to promote scientific research. Charles also encouraged a rebuilding programme, particularly in the last years of his reign, which included extensive rebuilding at Windsor Castle, a huge but uncompleted new palace at Winchester and the Greenwich Observatory. Charles was a patron of Christopher Wren in the design and rebuilding of St Paul´s Cathedral, Chelsea Hospital (a refuge for old war veterans) and other London buildings. Charles died in 1685, becoming a Roman Catholic on his deathbed.